Katy’s sister (also CIS alumna), her father, and Katy at a USC football game. Katy attended CIS from 6th to 12th grade and graduated in 2014. Following her graduation, Katy attended the University of Southern California. She majored in International Relations with a minor in Global Health. She worked internationally as an English teacher for children and university students - in Spain as an au pair and elementary school teacher from 2014-2015, and as a Fulbright English Teaching Assistant in Brazil since February 2018. Katy and her Spanish family who she lived and worked with teaching English for a year in Madrid, Spain. Katy has many fond memories of CIS. She loved being a part of student council and served as the organization’s president her senior year. The experience piqued an interest in event coordination that has stayed with her until now and has become part of her career goals. She also participated in basketball and cross country. The cross country team was especially meaningful because she ran with the boys team for a year until a girls team was created, and then she ran alone on the girls team until her senior year when more girls joined. Being a part of creating the team was very rewarding for her. But a memory that stands out the most to Katy is Mr. Bricker's teaching style. She attempts to emulate it every time she is with her students. “He always demanded excellence from his students. He would shut the door on you if you were late and he would scold you for not having your grade sheet in order. At the same time, he taught in a way that you didn't realize you were learning but you remembered the lessons because they were dynamic and engaging. Even up to the test review, which was often a jeopardy game full of dramatic daily doubles. 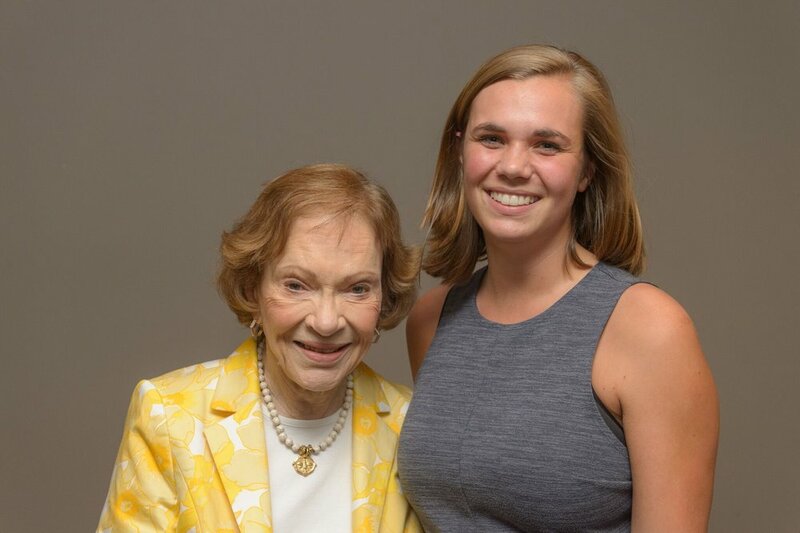 Katy and Rosalynn Carter at an event at the Carter Center.